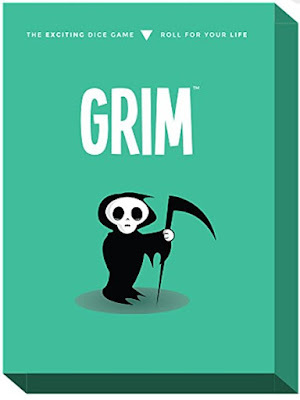 Published in 2015 following a successful Kickstarter campaign, Grim Games’ Grim is a push your luck, dice rolling, take that game in the which players must compete against each other in a humorous dice game of Grim’s own design in an attempt to save themselves from a GrimFATE in the AfterRealm. Described as ‘The Exciting Dice Game’ in which your ‘Roll For Your Life’, it is a filler game, designed for between two and six players, aged ten plus, which can be played in approximately fifteen minutes. The game consists of one-hundred-and-twenty green Grim counters, eighteen red Strike counters, six Grim Scorecards, decks of Grim’s Hand and Grim’s Decision cards, a deck of GrimFATE cards, a green twelve-sided die, and three Grim dice. The latter are six-sided dice, each marked with Grim’s face in red, blue, and green. Both the Grim’s Hand and Grim’s Decision cards are circular in shape, whereas the GrimFATE cards are standard shaped. The Grim’s Hand cards are a way of striking at rival players, whilst the Grim’s Decision cards are optional penalty cards that a player may be forced to take. The objective for each player in the game is to rid themselves of their green Grim counters, either by passing them to rival players or handing them over to Grim himself. Each turn, a player rolls the Grim dice to generate Grim counters to either turn in or save them up to purchase Grim’s Hand cards. By ridding himself of all of his Grim counters, a player earns the right to go one-on-one with Grim. If the player loses, he restarts play with ten green Grim counters, but if he wins, he gains immortality, wins the game, and all of the other players have to read out their GrimFATE cards as the losers. At the beginning of the game, each player receives a Grim Scorecard, ten Grim Counters, and a Grim Fate card. The latter is dealt out randomly and kept face down and hidden from everyone until the end of the game—even its owner does not know what his ultimate fate is… The Grim’s Hand cards are placed in easy reach, along with the twelve-sided die. Once a player has either given all of his green Grim counters to Grim or other players, he can duel Grim himself. This involves the duelling player attempting to roll higher then Grim on the twelve-sided die. The duelling players gets three rolls to beat the number rolled by Grim, but the actual number to beat is actually determined by the other players. They in turn, each roll the twelve-sided die, and whomever rolls the highest, sets the target to beat for the duelling player. If the duelling player beats Grim’s number then he wins; if he rolls lower than Grim’s number, he loses; and if the result is a tie, the duel starts all over again. Physically, Grim is well presented. The card quality is decent, the dice are actually quite nice, and the counters solid. The rules leaflet is perhaps a little underwritten, but the game is easy enough to pick up. So instead of accumulating resources or tokens, Grim is all about getting rid of them, either to Grim himself or on to other players, the latter via the Grim’s Hand cards. To support that though—as well as the duelling, which sometimes can be against other players rather than Grim if the right Grim’s Hand card is played—the game is all about dice rolling and luck and knowing when to stop rolling (or not). Which all means that Grim is just a very light filler of a game. The game’s mortal theme may not be to everyone’s tastes—some parents might object to it as being unsuitable for younger players, for example—but that said, the treatment of that theme is very superficial. It is by its very nature also humorous, the text of the GrimFATE cards not only be so, but grim too. One issue with the dice rolling and the randomness is that can prevent player after player from acting and it can stop player after player losing duels with Grim. When this happens, the game will last longer than the suggested fifteen minutes, which for a game as light as this, is perhaps too long a playing time. Ultimately, Grim is just okay. It is a silly way to pass fifteen minutes before moving on to the more engaging and deeper game of your choice, but nothing more. Which is fine, except there is not really enough in Grim to come back to more than a few times, so even as a filler, Grim is not quite filling enough.